The U.S.S. Enterprise travels to the M-class planet Sigma Iotia II, last visited by the starship Horizon, a century earlier. That starship reported that the denizens of the planet were bright, and extremely imitative. When Captain Kirk (William Shatner), Mr. Spock (Leonard Nimoy) and Dr. McCoy (De Forest Kelley) beam down, they find out just how bright and imitative the people are. Influenced by a book left behind the Horizon crew -- Chicago Mobs of the Twenties -- the inhabitants of the planet have modeled their entire existence after the gangsters of that decade. It’s a world of Al Capones! Kirk realizes he must undo the “contamination” caused by the Horizon, and sets about to re-organize the planet into something less blood-thirsty and chaotic. Still, it will take an act of herculean strength (and patience…) to rally the mob bosses of the planet, including Bela Oxmyx (Anthony Caruso) and Jojo Krako (Vic Tayback). To achieve this end, Kirk realizes -- to Spock’s chagrin and dismay -- that he must out-gangster the gangsters. As I’ve written before, Star Trek (1966-1969) appears to have become intrinsically more formulaic and repetitive in its second season. In the case of the latter formula, the stories involved the exploration of planets that were perfect “parallels” to specific societies of cultures on Earth, like Ancient Rome, Chicago of the 1920s, or Nazi Germany. This type of tale was a cost-saving expedient that allowed the production team to re-use (inexpensive) studio settings and costumes, created for other films and TV programs. The problem was (and is) that there is no consistent scientific explanation, typically, or rationale, for the parallel worlds (until "The Paradise Syndrome). At least "A Piece of the Action" comes up with a reason why a world would develop in such an identical, or parallel fashion: cultural contamination. 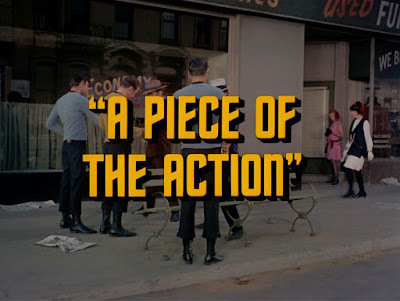 thus “A Piece of the Action” may be the best of the not-great “parallel Earth” bunch (which could also include the first season episode “Miri,” I suppose). I make this assessment not because of the admittedly hokey humor and hammy Shatner performance, but for two reasons. First, the episode carries a deep and sharply satirical sub-text about the pitfalls of organized religion. And secondly because the episode is, surely, the inspiration for the fish-out-of-water humor of Star Trek IV: The Voyage Home (1986), arguably the most unique of the Star Trek original cast features. Let’s talk about satire first. “A Piece of the Action” is a cautionary tale about what happens when a culture models all behavior on the writings in a single text or book. 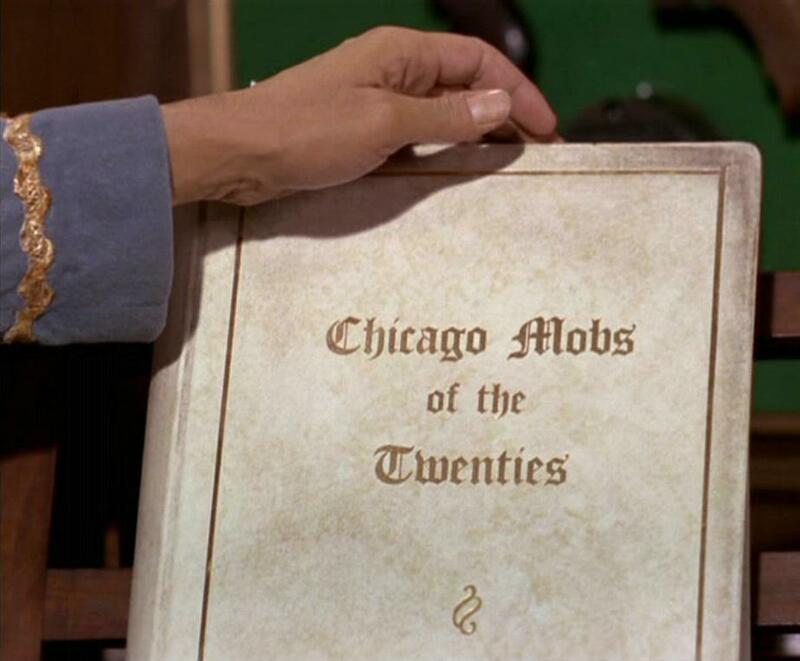 In this case, that book is a history tome about gangsters in Chicago of the early 20th century. But in the case of reality, we see that all the major world religions, basically, carry a “holy book” which is to be obeyed, and in many cases, taken literally. The belief in the “truth” of this book (and its wisdom as a way of life) has led some people, in some cultures, to reject scientific theories (evolution) and even scientific fact (the fossil record, for example). It has led other people to hate and judge other people, namely homosexuals, based on a possibly corrupted interpretation of one passage (in Leviticus). Now, the idea is not that books -- including holy ones -- can’t provide wisdom and guidance, or share history and knowledge. Rather, it is that using one -- and only one -- book as the basis for every aspect of civilization is, well, limiting (if not downright crazy). Consider the Iotians. They are smart, resourceful, clever individuals, and they squander all those natural resources on petty mob-land hits and useless, repetitive violence. Citizens suffer and die on the edicts of the book, not because the book is “bad,” per se, but because it has been interpreted literally as the foundation of a culture. If “Return of the Archons” was Star Trek’s deadly serious indictment of religion as mind-numbing and dogmatic, “A Piece of the Action” is the series’ brutal satire about those who would rather let a book do their thinking for them, in the face of scientific fact; in the face of reality and reason, actually. Lest anyone suggest I am reading too deeply into the episode, consider that both the Christian Bible and Chicago Mobs of the Twenties are sometimes referred to as “The Book.” And consider also how those indoctrinated into organized religion -- and the Iotians living the mobster life -- respond to frank, analytical discussion of “The Book.” It is considered an affront to insult "The Book," or for that matter, rationally discuss or question what it has to say. Although some of the humor -- and delivery of that humor -- in “A Piece of the Action” is cringe-worthy, I’ll go out on a limb and suggest that this episode is the most consistently and purposefully funny of Star Trek’s three second season comedies, the other two being “I, Mudd” and “The Trouble with Tribbles.” The episode is both funny, and a scathing, spot-on critique of religion, and those who would take Holy Books as gospel, literal truth. 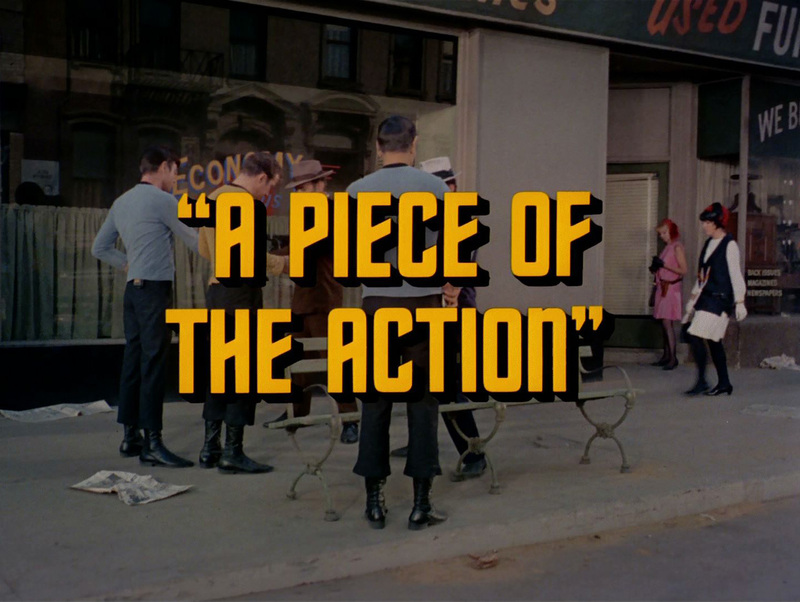 “A Piece of the Action” also predicts and spearheads the style of fish-out-of-water humor that is so beloved in The Voyage Home. Also, in both situations, the Enterprise crew must accomplish a mission of planetary significance, while blending in with “the native” population. Here, it is especially enjoyable to watch Spock contend with Kirk’s very poor driving of an automobile. Also, Scotty’s (poor) attempts to ape 1920 gangster lingo are priceless. If there is any single distasteful aspect of the episode, it is likely the gunboat diplomacy angle. 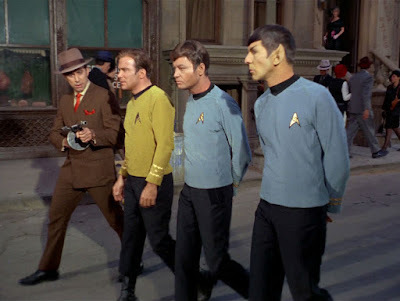 Kirk becomes boss, or top dog, on the planet, by using the ship’s phasers on a whole street block. The action is justifiable, given that it was the Federation/Starfleet that caused the planet to develop strangely in the first place, but it is always unfortunate to see a Star Trek episode’s climax rely on the fact that the Enterprise possesses superior weaponry. 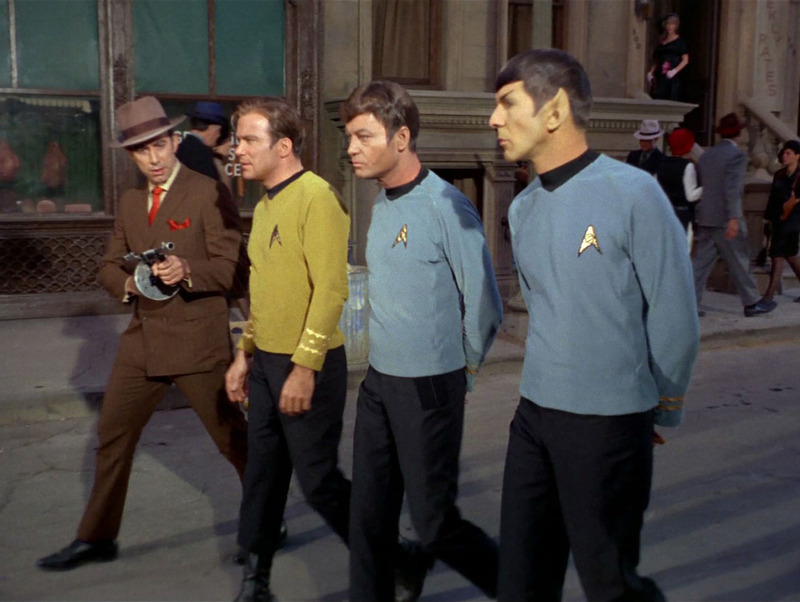 The finale scene on the bridge as Spock and Kirk, with humor, are disappointed in McCoy having left his communicator on the planet. Stating that the Iotians will want their piece of the action from the Federation. This final scene always gives me a nice laugh ending this humorous episode. I like this review. I never got the parallels between "The Books." Am I starting to sound like a broken record? This is a funny and enjoyable episode. Kirk talking to the kid who gives us the episode's title is a highlight. It's worth noting that this episode, through its subtext, remains relevant and perhaps is exceedingly relevant nowadays. Even today, we live in a culture that will reject scientific findings and human ingenuity in favor of words written many hundreds of years ago. These words were never meant to be taken literally, and it almost seems like a backlash against modernity that they are, and are influencing opinions of some, arguably for the worse and not for the better. Personally, I think our society has more in common with the Iotians right now than with the good crew of the U.S.S. Enterprise! That's what makes Star Trek so great; it gives us a better standard to strive towards. Not that the Books don't, but I've yet to hear someone use Star Trek as an argument against LGBTQ rights. Although I agree to some extent with your idea of "A Piece of the Action" being about the dangers of literalism in religion, John, I always thought this episode was really about cargo cults! My uncle spent part of WWII in the remotest jungles of Papua, New Guinea, and the cargo cult that had developed there as a result of earlier contact with modernity was a source of endless stories. Much ritual and spirituality had developed, following a plane crash on the island, that was based on waiting for more boxes to fall from the sky at any moment. Various crates and odds and ends had been adopted as totems that had become central to daily observance among the natives. It was very much like the sudden appearance of a Coke bottle in the African bush in "The Gods Must Be Crazy" (a must-see movie if you've never seen it). Many of Star Trek's writers, or production staff at least, had served during WWII or the Korean War and probably either encountered or heard of similar cargo cults. I understand your point about having to resolve a situation by superior weaponry, but I think the point is mitigated by two factors: 1, in this instance the "weapon" does zero damage--I expect afterward a lot of people just woke up wondering what happened--and, 2, the demonstration is absolutely necessary, more necessary than your statement implies. Right before that, the bosses are declaring outright (not just insinuating) that maybe the Enterprise isn't capable of compelling their cooperation, that one guy only saw one small part of the ship and they've mostly only seen hints of what Kirk has told them of their capability. He's about to a full-blown riot on his hands, and what do you suppose that will entail if it gets going? Machine gun battles that take out more citizens. The only way to prevent more of the same is indeed to prove the existence of a superior firepower to convince the bosses that cooperation with one another is better than murderous hits. It's only in retrospect, with the advantage of perfect hindsight, that gunboat diplomacy has gotten a bad rap. Not all gunboat diplomacy is equal, or equally bad, and some of it has been absolutely necessary to prevent even worse atrocities. I'm much more worried about McCoy's communicator being left behind! I've always wanted a story to revisit the Iotians to find out how in the world they incorporated that into their society! Sincerely want to find the answer print of this one and burn it with fire. Extremely interesting points here, I agree, regarding both the cargo cults and gunboat diplomacy. Also, it would have been wonderful to have seen perhaps a Next Generation episode about the Iotians advancements due to McCoy's communicator. With their penchant for replicating other societies, I always thought maybe the Iotians became the Federation's primary restoration specialists--great at duplicating, refurbishing, overhauling and restoring everything from old buildings to starships! Perfect location for a starbase. John and Sheri: Some insightful analysis here! I too think this one is very entertaining and funny. While the Enterprise and crew will ultimately get the upper hand, the story is an effective overview of what can happen when a society all too readily, and conveniently, goes to one book for its 'system'. John Frum and the "cargo cult", for sure. 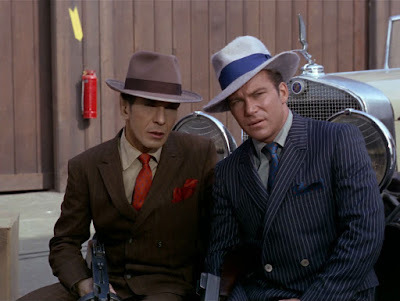 Yes, those are expensive suits and hats Kirk and Spock are wearing. This episode is so well cast, particularly Anthony Caruso and Vic Tayback. 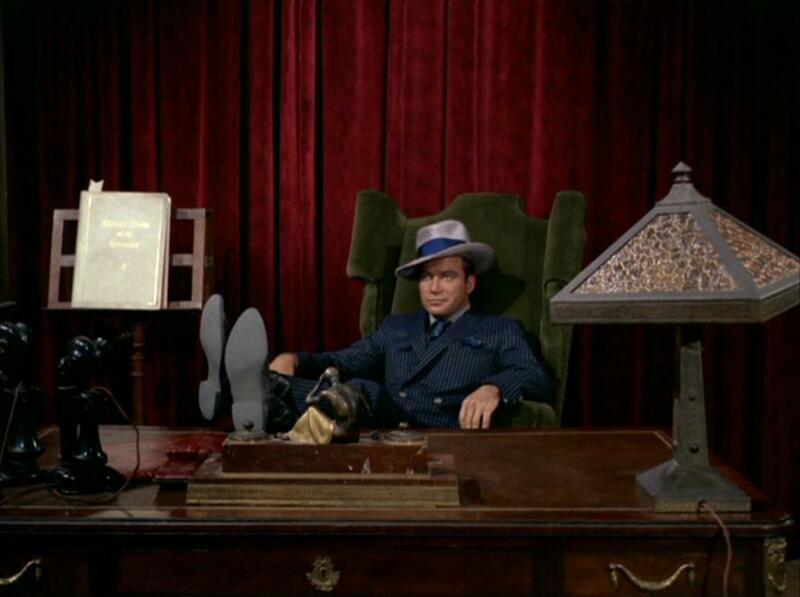 And from what I've read, William Shatner totally improvised "Fizzbin" during the scene! Mindboggling. I've long thought that a certain joke in the script referred to the wardrobe costs. Kirk tells the one hood he wants a suit by stating that it looks expensive. The man about to lose his jacket says, "It oughta... it cost me a bundle". No doubt this was a wink by the writers regarding the series' wardrobe requirements. Apparently McCoy's boot scene in "Patterns of Force" was a nod to the problems the cast had with their original fitted boots. Before the series started production a company was hired to manufacture the Starfleet footwear. When the cameras started rolling the cast discovered their boots to be very uncomfortable. All the boots had to be rebuilt by another company at great cost. The Fizzbin scene is wonderful. Yes, the casting was terrific. I have never computed them, Captain.